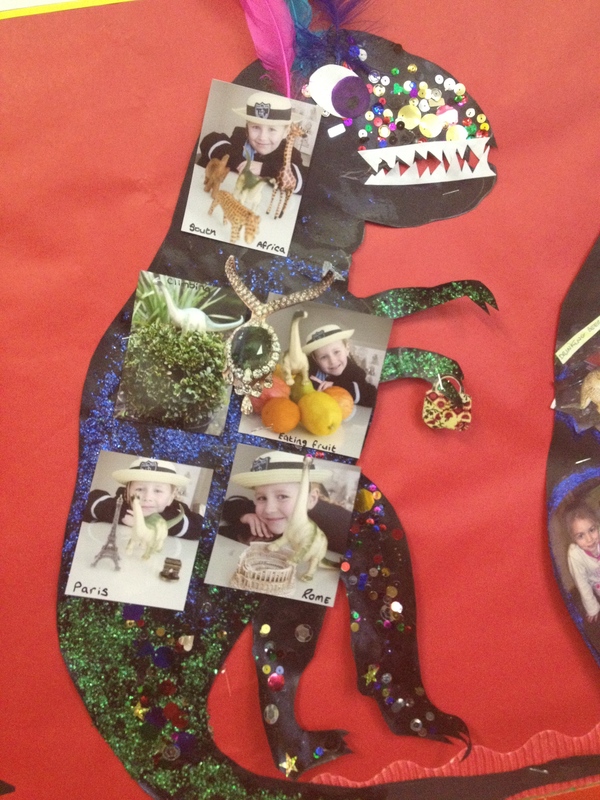 Yoga, Dinosaurs and The Heart…. a tour of our projects! We are really happy that summer has returned to Ireland! It is brilliant to be able to take advantage of the warm afternoons in the park playing with our friends. Its just the kind of relaxation we need after all our hectic project work for Open Day 2012. This years Open Day was on Saturday 12th May and we were delighted to have so many visitors. Our students came with their families and friends and were so good at explaining all our hard work and projects to everyone. It was great to see so many new faces too, we look forward to getting to know you all better. The students are eager to share their work with all our blog readers so here is a little recap of the projects and classwork. 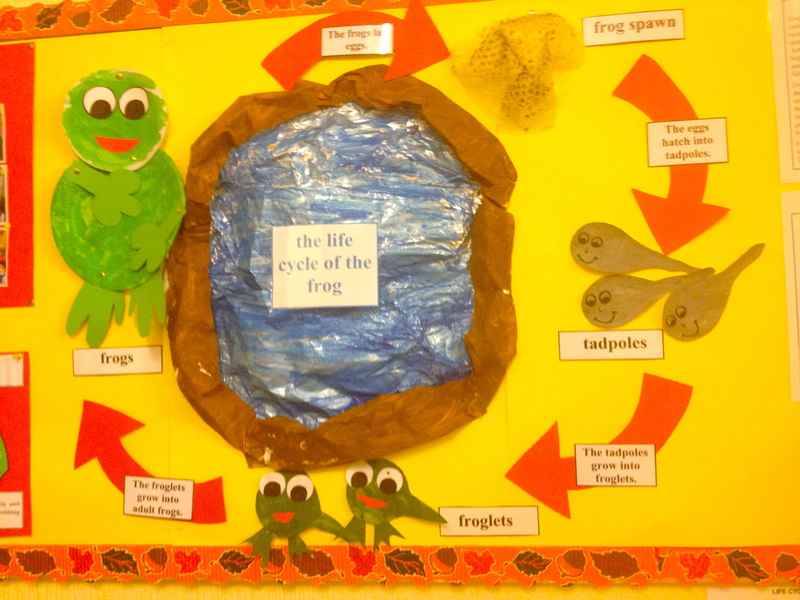 The Preschool Class studied the lifecycle of the frog and the difference between frogs and toads. They learned the poem Five green & Speckled frogs and played the Speckled frog game. 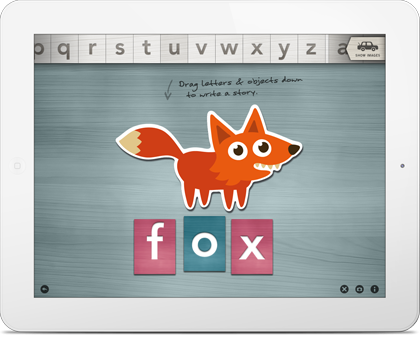 Playing games and learning poetry appeals to those that learn best through movement (kinaesthetic) and song (verbal). 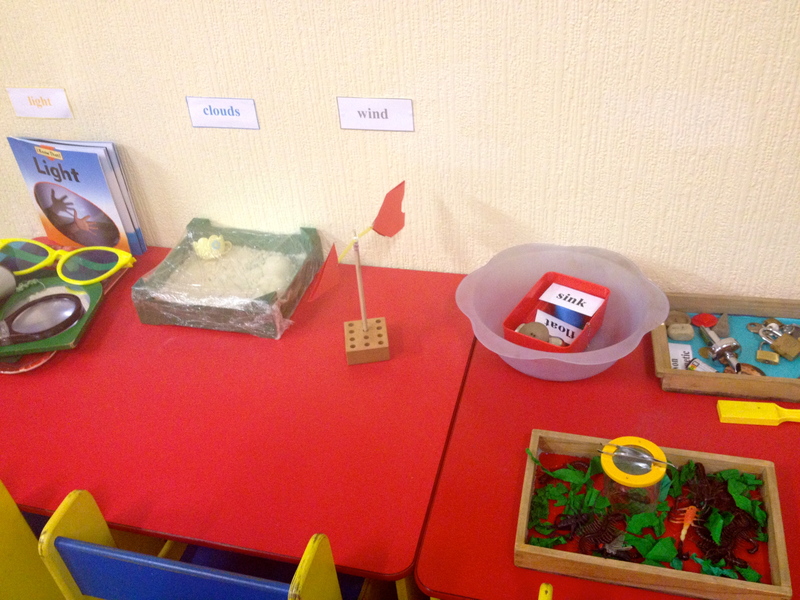 We have many types of learners in our community and it is in our early years classroom that we observe the children first, to discover their learning styles. This is information that will be invaluable as they grow with us, enabling us to tailor the presentation and content of lessons to each child’s learning style. 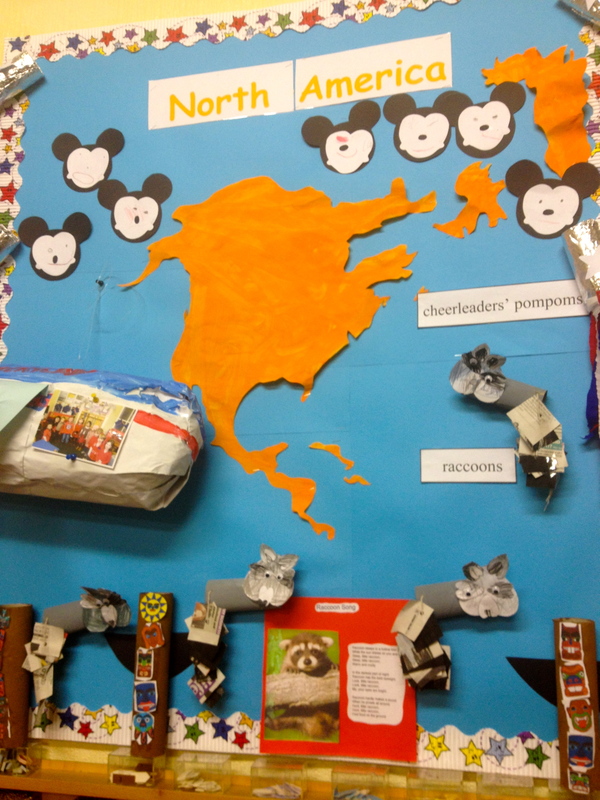 In Geography the pre-schoolers tackled the continent of North America, they learned about animals and plants native to the continent. They also created their own personal totem poles to represent themselves and made dream catchers. I love the airplane with a photo of the whole class “flying to America”. Our Science corner was very popular and we created lots of hands on learning experiences with the children to explain light and colour, wind and weather. 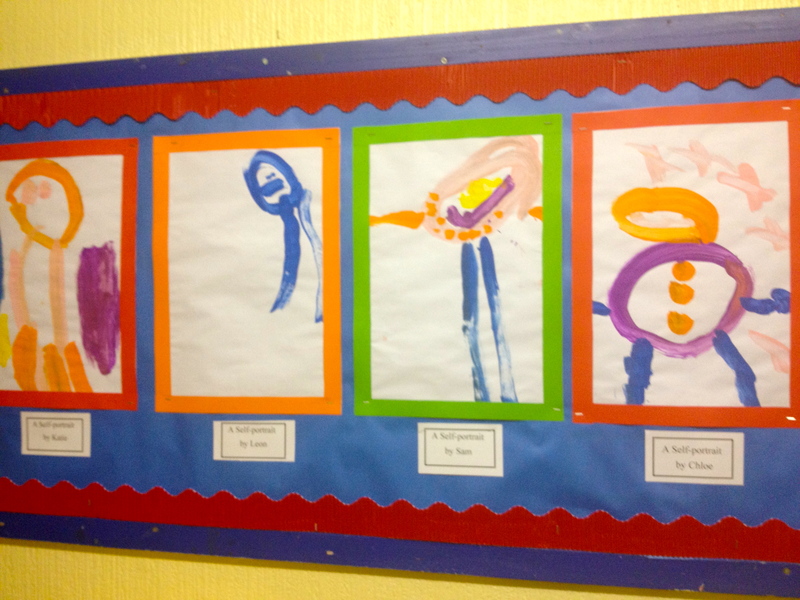 For many visitors their favourite part of the pre-schooler’s displays were the Self Portraits, listening to the children explain each part of the portrait to their family and classmates is adorable and the self confidence they show is a treasure to hold on to. 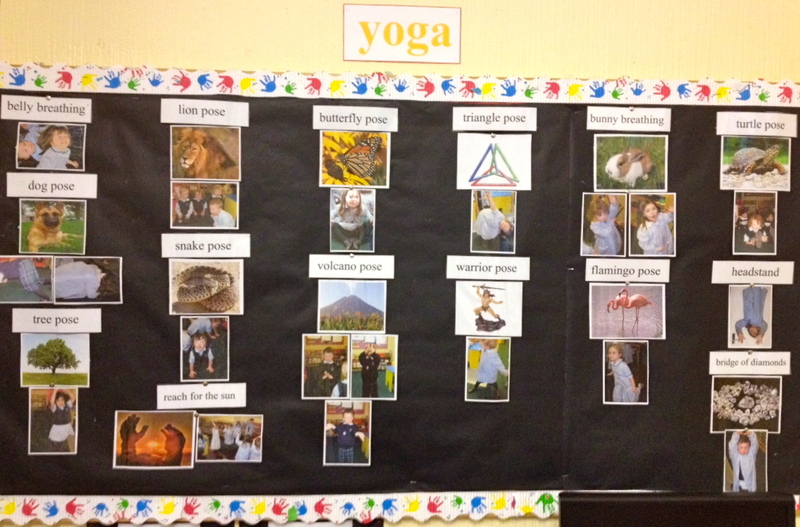 Finally the preschool class would like to share with you their Yoga classes that they have been taking with Lisa and Magna. They have learned lots of poses and are really enjoying them all.It’s a very fun and relaxing time for all. Speaking of relaxing, its tough being a 3year old and when the world is just getting too much our pre-schoolers have a place they can revive their sense of chi. 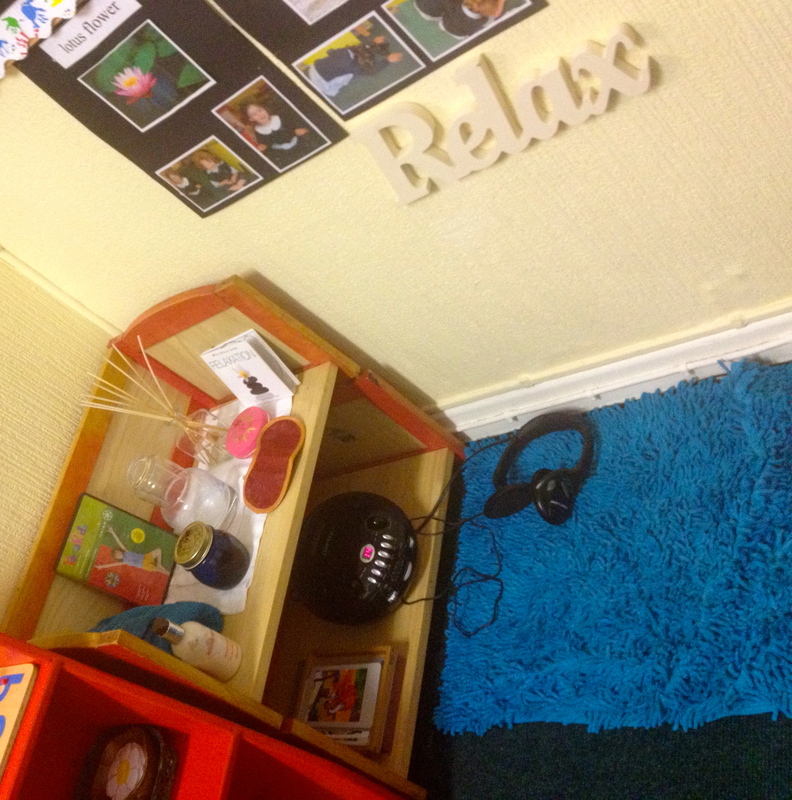 The “Relax” Corner, has a soft mat, nice music and calming scents, plus soothing hand cream. It’s an express spa for toddlers! Namaste Pre-schoolers! 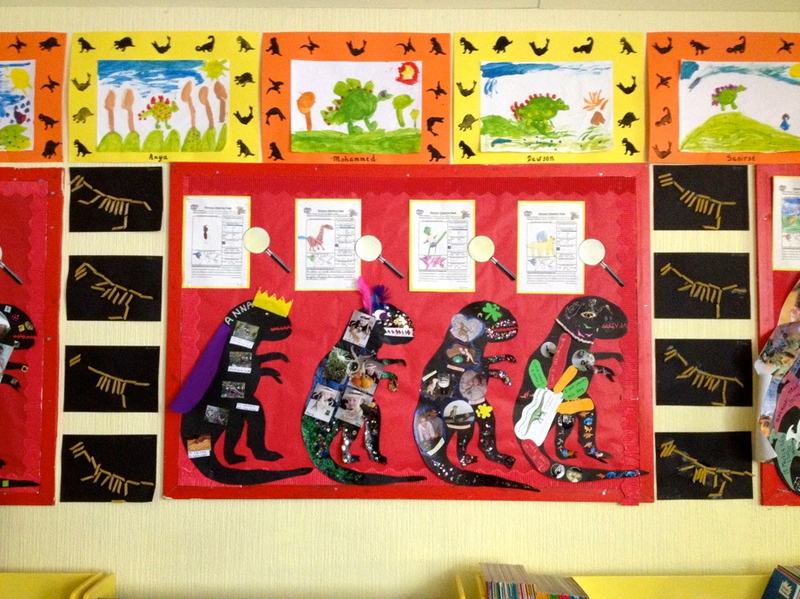 Things were no less busy in the reception class where Junior and Senior Infants studied Dinosaurs and The Evolution of Humans. The project Walking with the Dinosaurs was really fun, each student picked one of our model dinosaurs to take home for a weekend. They named it and brought it on an adventure, took photos and made a Dinosaur presentation with the information and images. Very personal and very informative. 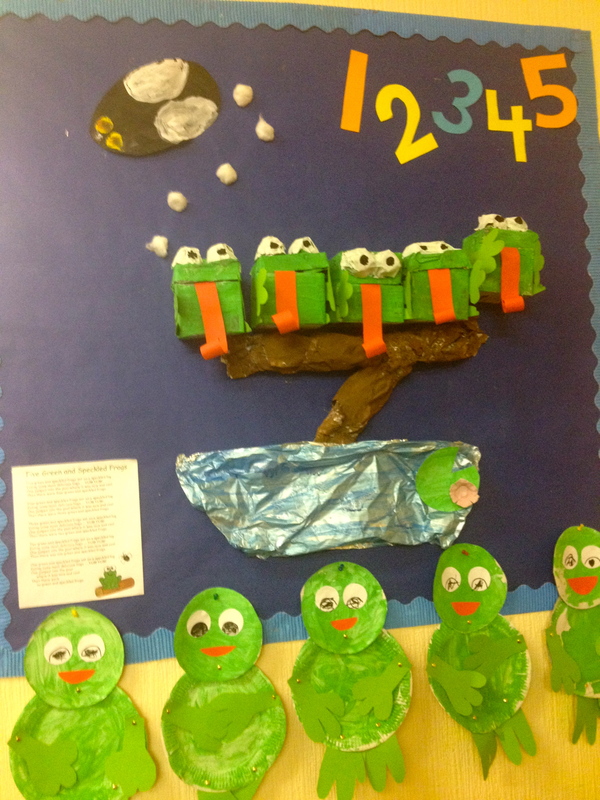 Projects like this allow the students to express their uniqueness, the idea of the students as people in their own right is really emerging in this class, and they are encouraged to foster a sense of themselves, their abilities and individual natures. The study of the evolution of humankind was fascinating, they learned about fossils and archaeology, making their own archaeological finds. 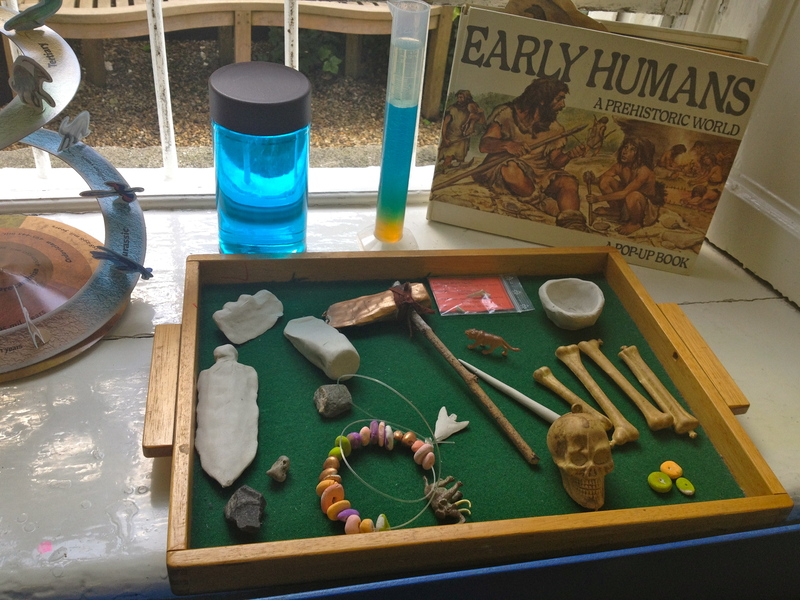 Learning about early human kind, their tools and habitats gives the children an expanding sense of what it means to be human, what qualities we need to survive and what sets us apart. This is all incredibly important to the emerging sense of self our students have in this age group. 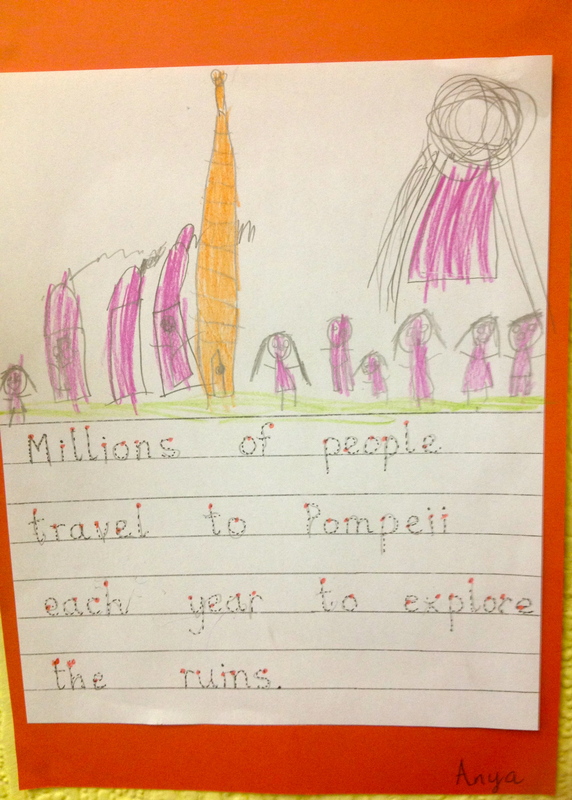 In geography reception class explored Europe and it’s Volcanoes, specifically Pompeii. They made a giant paper volcano for the fireplace, complete with falling ash! Their handwriting samples bare testimony to how far they have come since the beginning of the term. Again with the study of early humankind, the use of tools has been one factor that sets us apart, mark making being one of the most important. These young students have made fantastic progress with their handwriting and it is obvious these students are going to be separate from the rest! 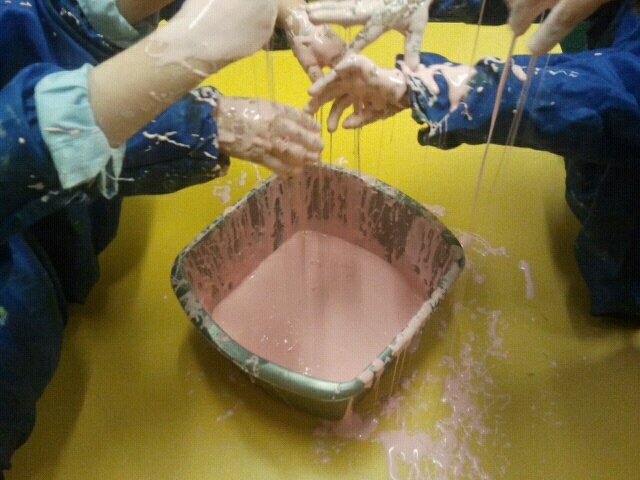 There was so much complementary work to the study themes available in the classroom, one of the ways of keeping the children absorbing without even trying is to incorporate the lessons into all the activities, art, practical life, history, creative storytelling, Aoife and Katie work hard to ensure that it all ties in making the learning is open-ended and personal to the children. Check out the slide show at the end for more photos! The Senior Class were not snoozing on the job either, they took on some weighty projects befitting our stately seniors students! 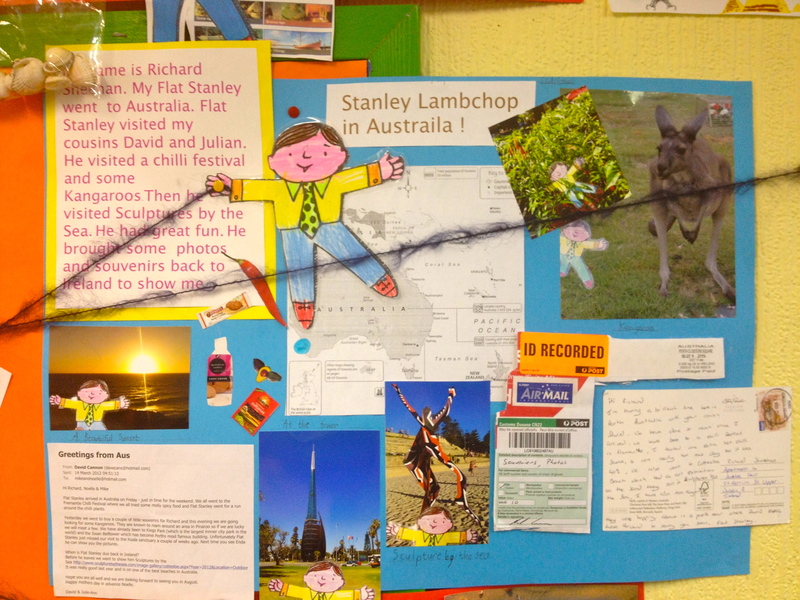 Flat Stanley showed us the world, as he embarked upon his travels to Hong Kong, America twice, (East and West Coast), South Africa, Amsterdam, Australia & Wexford to name but a few places! 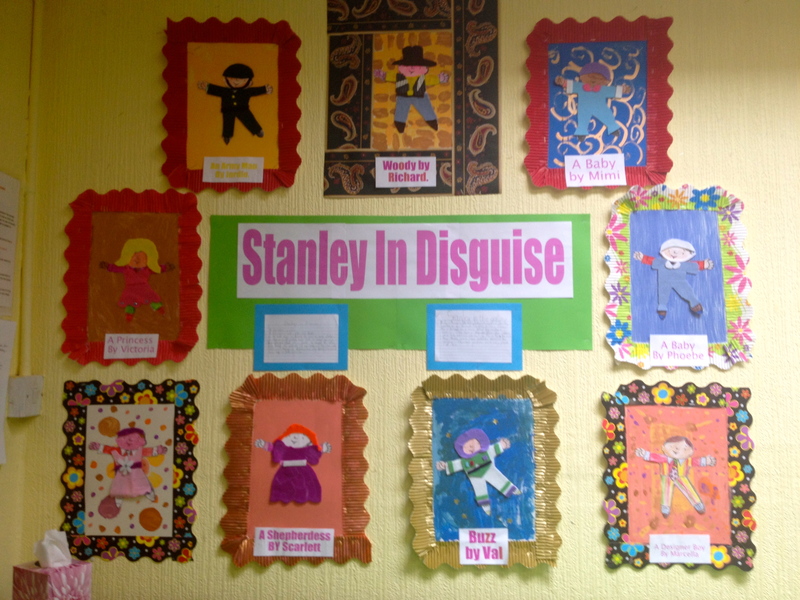 He played things incognito by trying on various disguises, designed by the students and the seniors finally made kites of Stanley Lambchop so he could continue his adventure wherever the wind took him! 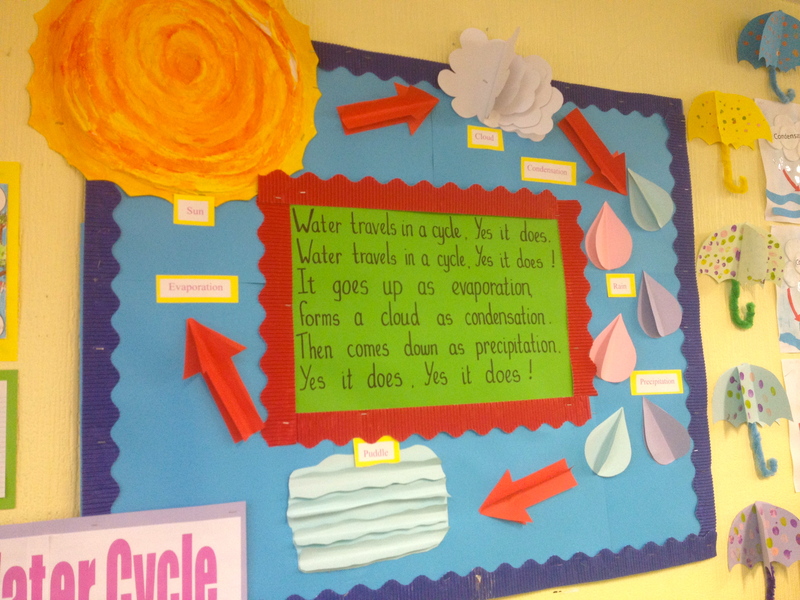 Speaking of weather, the seniors created a very 3D water cycle display board. I love the clouds and raindrops, very lifelike! 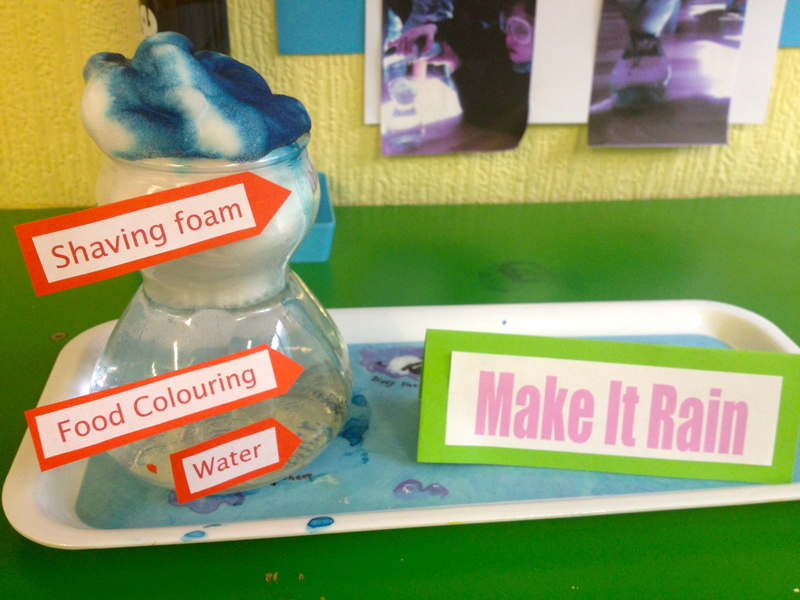 It is complete with their learning rhyme (to the tune of She’ll be coming round the mountain) being our scientific seniors they also partook in some weather related experiments; Making Rain in a Jar and The Evaporation Experiment (disappearing water). 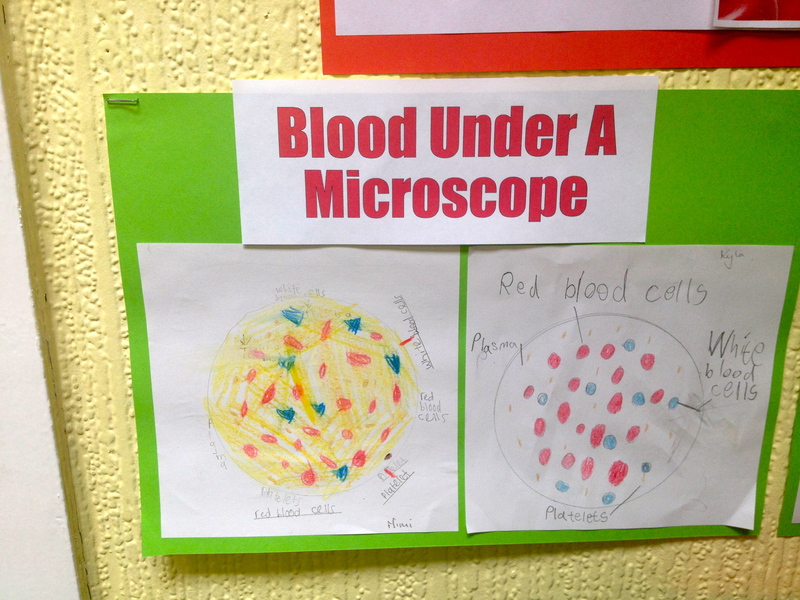 Of course these were not the only scientific experiments undertaken, studies of the heart and blood were the “piece de resistance” of this Science inspired Open Day project work. A heart dissection had earlier taken place with Ashley and was documented in photos on the wall. They learned about the components of a drop of blood, making their own replica of microscopic particles of blood, drawing their interpretation for display. 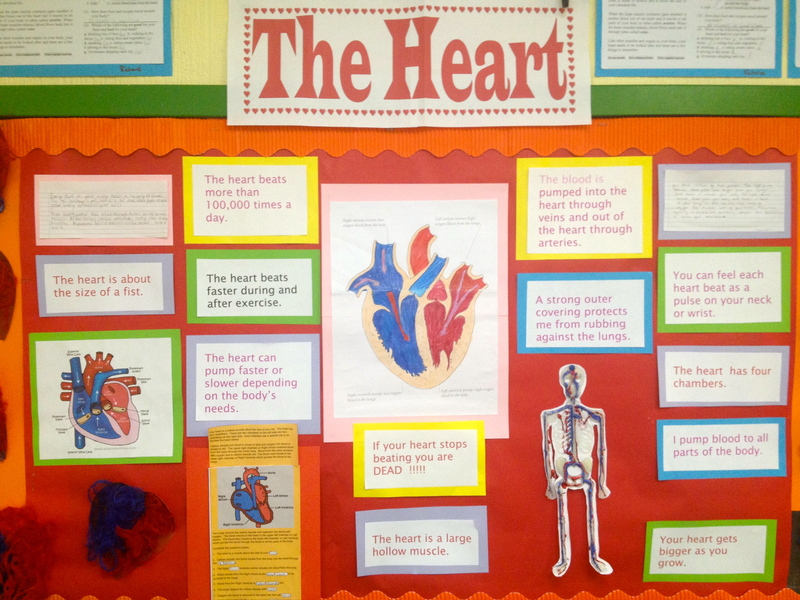 Studying the parts of the heart and lots of facts about blood they even made a quiz for parents. In fact we might get a copy and put it here in case you tried to skip the test!! The wonderful thing about our learning community is how well the students and teachers know each other, the projects really are a culmination of months and years of discovering what each child is already fascinated by or what even more importantly, they can develop a love for. The teachers on our staff prepare the topics armed with this knowledge and encourage the children with exactly the right information sparking the light of interest in each child confident that it will blaze within. The senior class also displayed their linguistic ability as Gaeilge with their micro studies Mo Chorp and in English, with wonderful creative writing essays on display. Of course there is lots of “all school” projects too, we don’t just stick to our classes, and many projects we enjoy come from our wonderful extracurricular classes, like ballet, music, drama, sport and new this year, Mandarin. 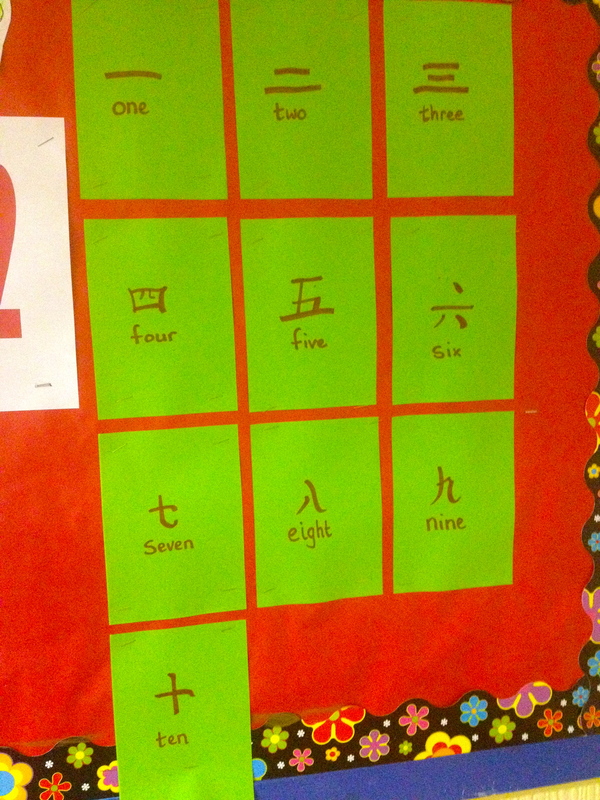 In honour of the year of the dragon we extended our dragon project to include sample or our chinese calligraphy and phrases we have learned! Now time for us to get to the park, and gear up for the summer term’s highlights of sports day and tennis camp! 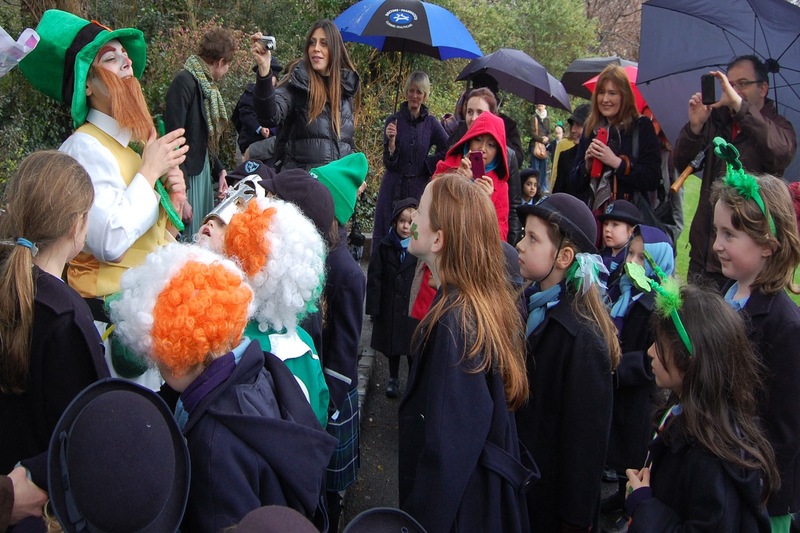 Spring Notes: Leprechaun hunt, Afterschool Activities and Open Day Invitation! 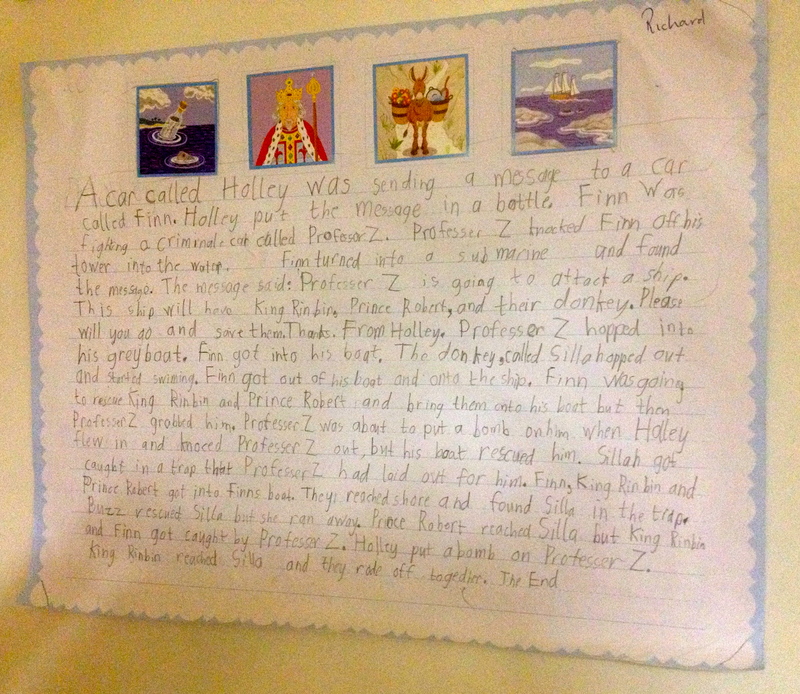 What an eventful March and April we have had at Hedley Park. Lots of news and events to share with you, but before we talk about all that has happened let us just remind you that this Saturday (May 12th) will be our annual summer Open Day. From 10am to 1pm you are very welcome to come and say hi, view our students work , classroom environments and ask any questions you may have. Current students and their family and friends will be there, as will any past students wanting to catch up with favourite teachers to share the news of their past years endeavours. So make your way to town for brunch and pop in on Saturday to see all the exciting display boards and ask our students all about their work. 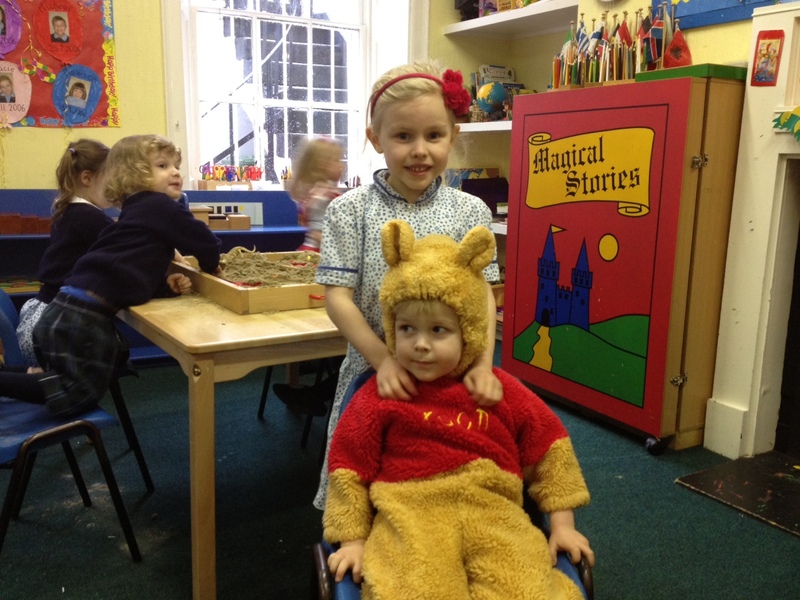 Back to our spring catch up; March was a hectic month the centrepiece of which was our fantastic St Patricks adventures. Beginning early in the month we set our Leprechaun trap, but we did not plan on him being so crafty. Day after day we found Larry had not only eaten the snack we left to tempt him but he had played with our shelves, left us notes, used our toilet and even left us a video message!! Still we could not catch him. 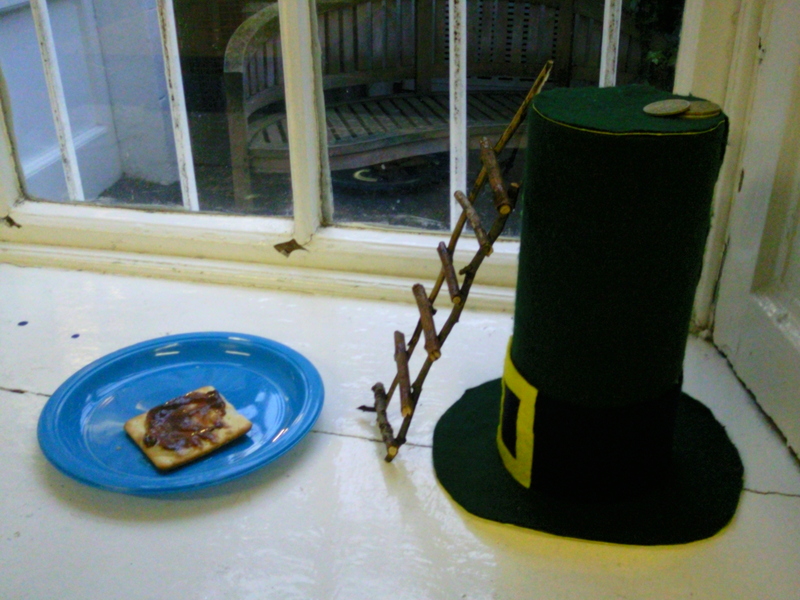 Leprechaun’s love Jam and Nutella on crackers! On the day of our St Patricks walk we knew the time running out and our excitement was growing, finally we would catch Larry and find our pot of gold! 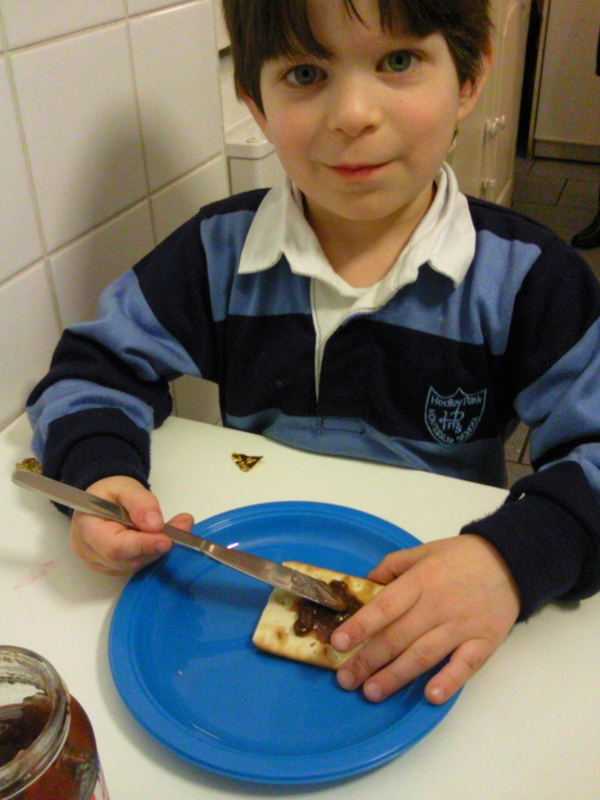 We had an early and impromptu Irish dancing lesson and ate slices of our rainbow cake. Then with an enthusiasm even the rain couldn’t dampen we set off to look for Leprechaun clues. 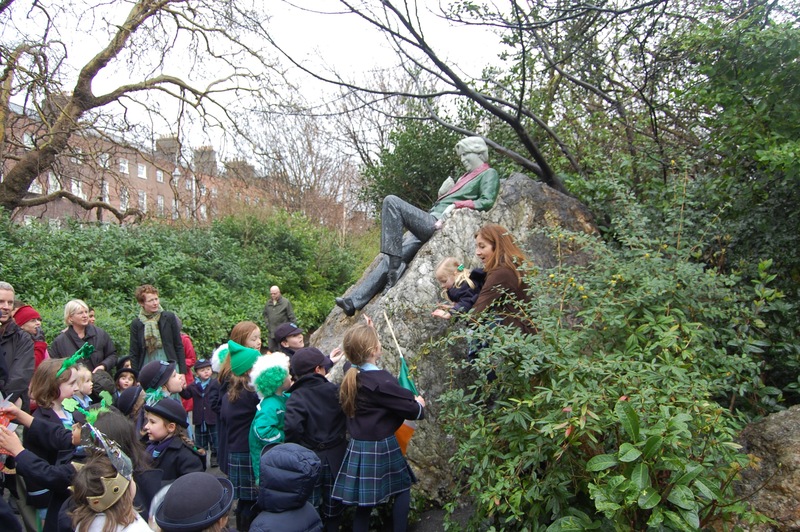 We looked high and low, around all the wonderful monuments in Merrion Square and yes, we did find our very own Hedley Park Leprechaun. 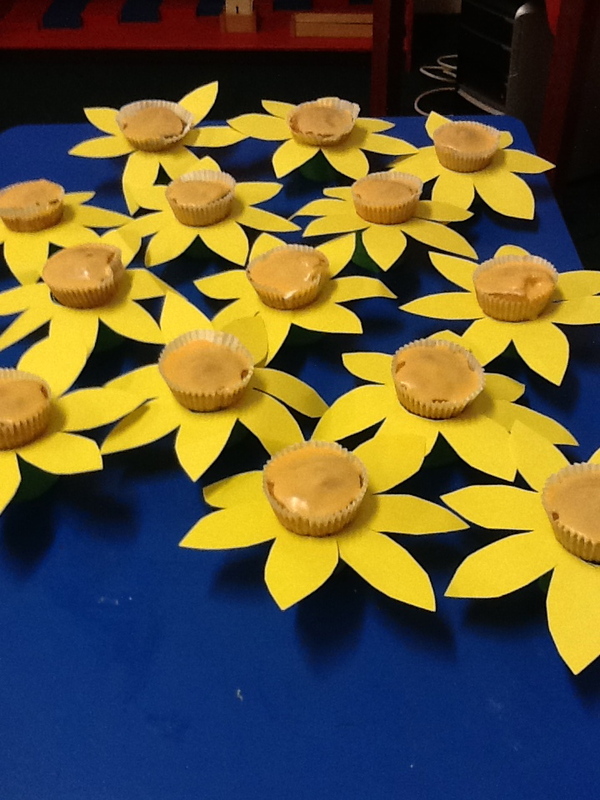 But that wasn’t the only thing happening in Hedley Park, March 23rdsaw ourDaffodil Day commemoration and the preschool class made fantastic daffodil cupcakes to mark the day. 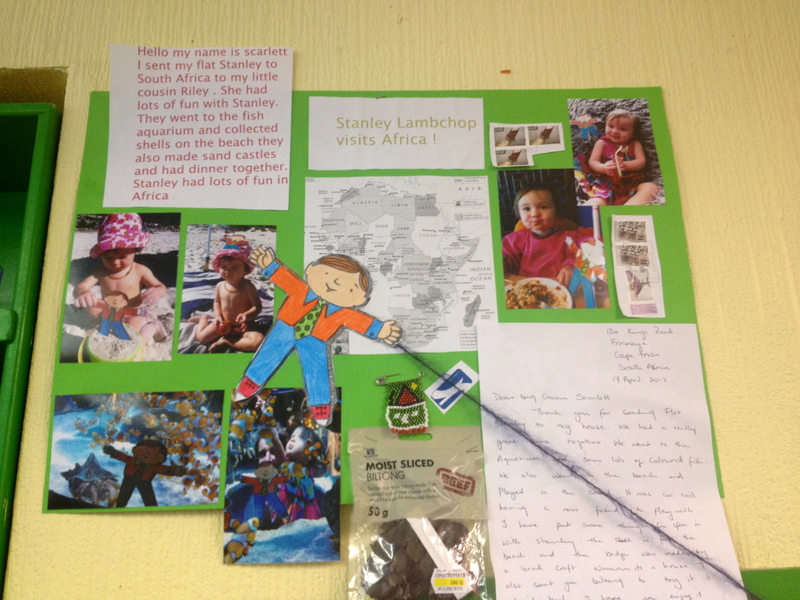 We also learned about the chicken lifecycle by creating a lovely display board, just in time for the Easter break. Our afternoons have also been really fun packed. 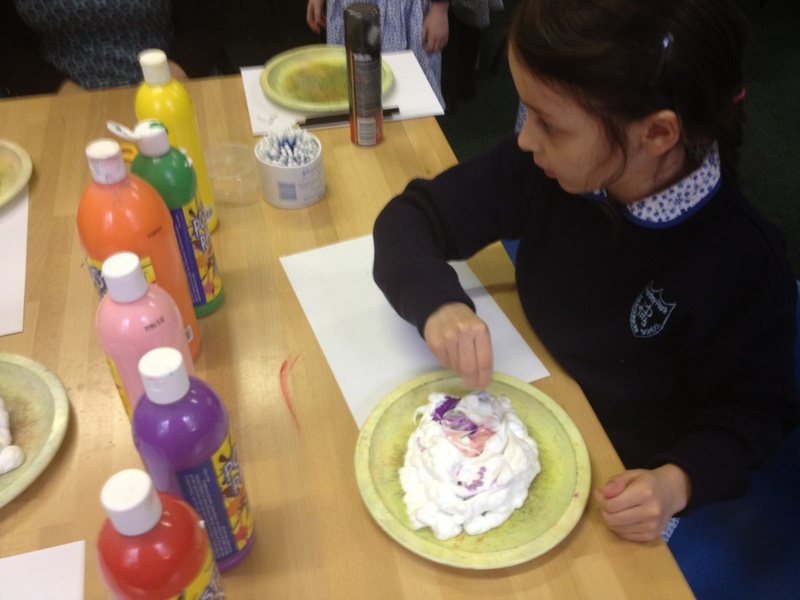 Lots of arts and crafts, gloop making and shaving foam painting being two on offer, and enjoyable games like musical chairs not to mention freeplay and dressing up. All of these allow us to work together and enhance our creative and imaginative capabilities. Children learn much about themselves during freeplay sessions, creative outlets, social play and personal projects give the child a fuller understanding of themselves and others. Our eager and interested teaching staff supervises the afternoons in Hedley but the children’s interests and wishes are the controlling factor. Allowing the children this freedom to decide what they spend their free time doing gives them a sense of empowerment and personal achievement that is at the heart of Montessori holistic education. Finally a big thank you to everyone who came along to our sponsored walk on March 30th, thanks to your generous donations we raised enough for 3 more iPads! Now every class in Hedley Park has an iPad to research and learn on. 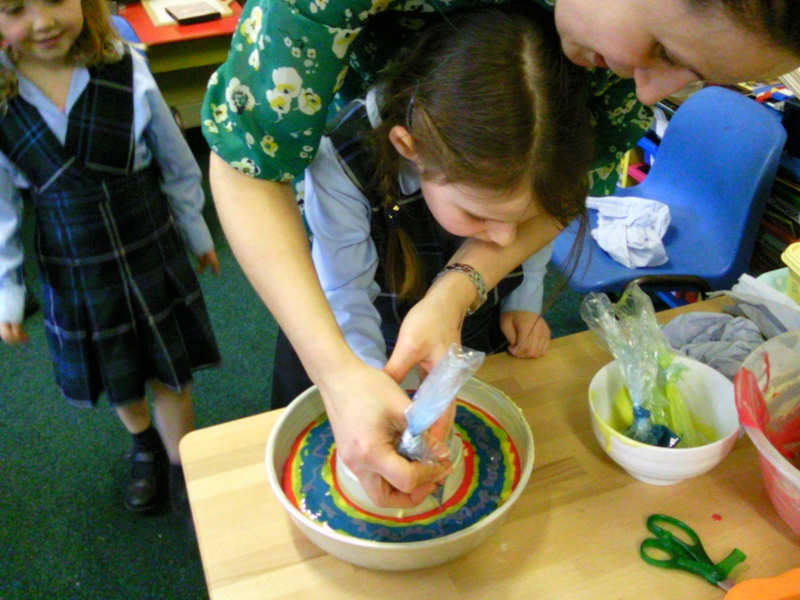 It is amazing to see the children use them with ease and confidence. Even the reception class are giving their iPad a daily workout, they particularly enjoy using Montessorium’s intro to letters and intro to numbers,to compliment their work with the Montessori materials for sounds and numbers. If you’d like to download them and use at home feel free to ask us about them at open day or next time you are in the school. While iPads will never replace the physical hands on with the beautiful Montessori materials in our classes, eLearning, confidence with computers and computer-assisted work are essential parts of the 21stcentury child’s learning portfolio. It’s the combination of traditional hands on learning and sophisticated eLearning in a natural and supportive setting that gives Hedley Park students the winning edge. 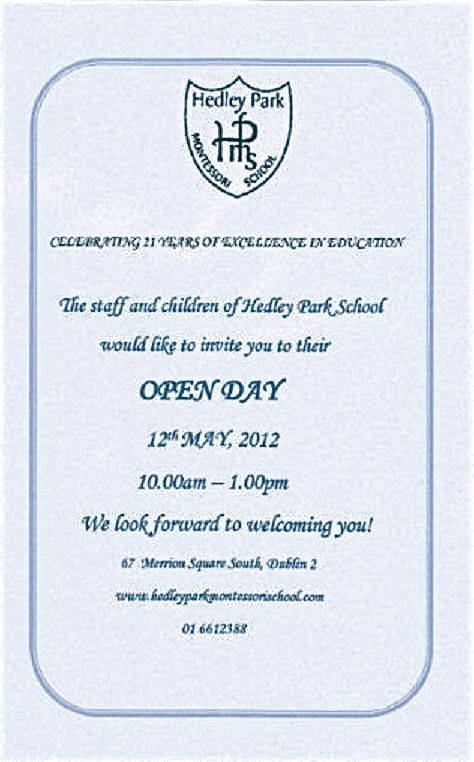 So don’t forget to drop in this Saturday between 10am-1pm to see our students as they showcase their work and fun class projects and meet our team of warm and dedicated teachers ready to welcome you to Hedley Park.